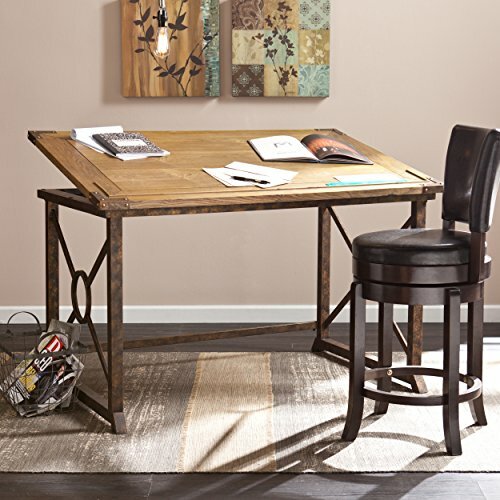 With a wide frame and ample work area, this industrial style drafting table is perfectly proportioned for larger spaces. Its wood tilt-top in weathered oak reclaims a rustic look against the durable, antique brass finish metal frame and accents. A built-in ridge spanning the extensive workspace secures papers and utensils while you work. Simply lift the back edge to modify the tabletop to an ideal incline position. Adjustable tabletop tilts up to 30 degrees for ergonomic comfort at any task. A broad work surface with full-length pencil ridge and an anti-slip hinge using raise-and-release mechanism are included. Dimensions include: Overall: 51.5"W x 32.75"D x 43.25" H Tabletop: 51.25" W x 32.5" D; Main work surface: 47" W x 29" D; Tilt range: 18 positions, 0-30 degrees; Chair/leg room: 43.5" W x 29.75" D x 27.5" H; Clearance: 43.5" W x 28" D x 1"/4" H (sides/back). This one-of-a-kind item approximately weighs 84 pound sand can support up to 60 lb. Only quality materials and manufacturing will do. Product materials include: Fir, MDF, Ash Veneer, Metal Tube, Metal Sheet. Assembly required. Made in China. If you have any questions about this product by Southern Enterprises, contact us by completing and submitting the form below. If you are looking for a specif part number, please include it with your message. Martin Pro-Draft Parallel Edge Board "B" Series 31"x42"